10 A None No Power Seat 10 A is a standard Business Class Open Suite located at the bulkhead. 10 B None No Power Seat 10 B is a standard Business Class Open Suite located at the bulkhead. 10 D None No Power Seat 10 D is a standard Business Class Open Suite located at the bulkhead. This seat is ideal if traveling with a companion. 10 G None No Power Seat 10 G is a standard Business Class Open Suite located at the bulkhead. This seat is ideal if traveling with a companion. 10 J None No Power Seat 10 J is a standard Business Class Open Suite located at the bulkhead. 10 K None No Power Seat 10 K is a standard Business Class Open Suite located at the bulkhead. 11 A None No Power Seat 11 A is a standard Business Class Open Suite. 11 B None No Power Seat 11 B is a standard Business Class Open Suite. 11 D None No Power Seat 11 D is a standard Business Class Open Suite. This seat is ideal if traveling with a companion. 11 G None No Power Seat 11 G is a standard Business Class Open Suite. This seat is ideal if traveling with a companion. 11 J None No Power Seat 11 J is a standard Business Class Open Suite. 11 K None No Power Seat 11 K is a standard Business Class Open Suite. 12 A None No Power Seat 12 A is a standard Business Class Open Suite. 12 B None No Power Seat 12 B is a standard Business Class Open Suite. The proximity to the lavatory and galley might be bothersome due to crew activity and light during nighttime. 12 D None No Power Seat 12 D is a standard Business Class Open Suite. This seat is ideal if traveling with a companion. 12 G None No Power Seat 12 G is a standard Business Class Open Suite. This seat is ideal if traveling with a companion. 12 J None No Power Seat 12 J is a standard Business Class Open Suite. The proximity to the lavatory and galley might be bothersome due to crew activity and light during nighttime. 12 K None No Power Seat 12 K is a standard Business Class Open Suite. 20 A None No Power Seat 20 A is a standard Economy Class seat that has extra legroom, but the proximity to the lavatory and galley may be bothersome. 20 B None No Power Seat 20 B is a standard Economy Class seat that has extra legroom, but the proximity to the lavatory and galley may be bothersome. 20 C None No Power Seat 20 C is a standard Economy Class seat that has extra legroom, but the proximity to the lavatory and galley may be bothersome. 20 D None No Power Seat 20 D is a standard Economy Class seat that has extra legroom, but the proximity to the lavatory and galley may be bothersome. 20 E None No Power Seat 20 E is a standard Economy Class seat that has extra legroom, but the proximity to the lavatory and galley may be bothersome. 20 F None No Power Seat 20 F is a standard Economy Class seat that has extra legroom, but the proximity to the lavatory and galley may be bothersome. 20 H None No Power Seat 20 H is a standard Economy Class seat that has extra legroom, but the proximity to the lavatory and galley may be bothersome. 20 J None No Power Seat 20 J is a standard Economy Class seat that has extra legroom, but the proximity to the lavatory and galley may be bothersome. 20 K None No Power Seat 20 K is a standard Economy Class seat that has extra legroom, but the proximity to the lavatory and galley may be bothersome. 36 J None No Power Seat 36 J is a standard Economy Class seat whose proximity to the lavatories may be bothersome. 36 K None No Power Seat 36 K is a standard Economy Class seat whose proximity to the lavatories may be bothersome. 37 A None No Power Seat 37 A is a standard Economy Class seat that has extra legroom due to the exit however, the proximity to the lavatories may be bothersome. 37 B None No Power Seat 37 B is a standard Economy Class seat that has extra legroom due to the exit however, the proximity to the lavatories may be bothersome. 37 C None No Power Seat 37 C is a standard Economy Class seat that has extra legroom due to the exit however, the proximity to the lavatories may be bothersome. 37 D None No Power Seat 37 D is a standard Economy Class seat that has extra legroom due to the exit however, the proximity to the lavatories may be bothersome. 37 E None No Power Seat 37 E is a standard Economy Class seat that has extra legroom due to the exit however, the proximity to the lavatories may be bothersome. 37 F None No Power Seat 37 F is a standard Economy Class seat that has extra legroom due to the exit however, the proximity to the lavatories may be bothersome. 37 H None No Power Seat 37 H is a standard Economy Class seat that has extra legroom due to the exit however, the proximity to the lavatories may be bothersome. 37 J None No Power Seat 37 J is a standard Economy Class seat that has extra legroom due to the exit however, the proximity to the lavatories may be bothersome. 37 K None No Power Seat 37 K is a standard Economy Class seat that has extra legroom due to the exit however, the proximity to the lavatories may be bothersome. 46 A None No Power Seat 46 A is a standard Economy Class seat that is in the last row of the plane. The proximity to the lavatories and galleys may be bothersome. 46 B None No Power Seat 46 B is a standard Economy Class seat that is in the last row of the plane. The proximity to the lavatories and galleys may be bothersome. 46 C None No Power Seat 46 C is a standard Economy Class seat that is in the last row of the plane. The proximity to the lavatories and galleys may be bothersome. 46 H None No Power Seat 46 H is a standard Economy Class seat that is in the last row of the plane. The proximity to the lavatories and galleys may be bothersome. 46 J None No Power Seat 46 J is a standard Economy Class seat that is in the last row of the plane. The proximity to the lavatories and galleys may be bothersome. 46 K None No Power Seat 46 K is a standard Economy Class seat that is in the last row of the plane. The proximity to the lavatories and galleys may be bothersome. 47 D None No Power Seat 47 D is a standard Economy Class seat whose proximity to the lavatory and galley may be bothersome. 47 F None No Power Seat 47 F is a standard Economy Class seat whose proximity to the lavatory and galley may be bothersome. 48 D None No Power Seat 48 D is a standard Economy Class seat that is in the last row of the plane. The proximity to the lavatories and galleys may be bothersome. 48 E None No Power Seat 48 E is a standard Economy Class seat that is in the last row of the plane. The proximity to the lavatories and galleys may be bothersome. 48 F None No Power Seat 48 F is a standard Economy Class seat that is in the last row of the plane. The proximity to the lavatories and galleys may be bothersome. 110v AC powerports are available at every seat in Business. Economy Class is equipped with 2 ports for every three seats. USB ports are available for every seat in the aircraft. Oman Air allows passengers to browse the internet on their smart phones at the rates of USD 5 and USD 15. You can also browse using your laptops or on In-flight seat back screens at the rate of USD 15 and USD 40. For more details, please click here. Oman Air's Boeing 788 operates on domestic routes between Muscat and Salalah and long-range routes to Europe. This aircraft operates in a two class configuration with 18 seats in Business Class and 249 seats in Economy Class. 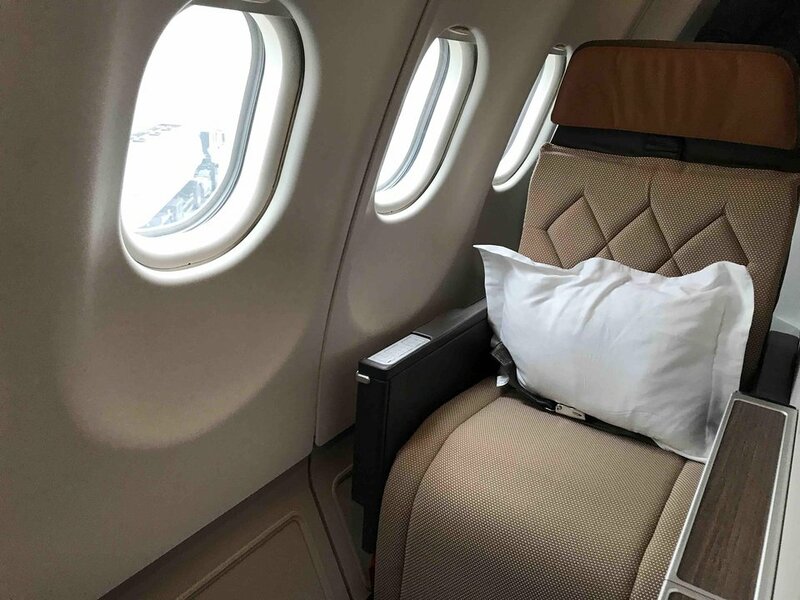 Business Class flat bed seating features a massage function with each seat getting direct aisle access, and Economy Class featuring new slimline seats. There are 2 versions of this aircraft at Oman Air. I was on both. This one has incredibly cramped legroom in eco! Therefore, I only did emergency exit there. Careful: Passengers cannot move to empty exit seats without having paid for it before. The staff control the boarding passes! I was the only one in emergency exit row - while the whole rest of the plane was fully booked. Business Class in this version is great - just as described by the airline NB: The other version has the emergency exit row in row 25. The rest of economy has slightly better legroom. Business class in this version is a bit old - not as advertised!!! Flew MCT-CDG on WY131 in business on the 787-8 A40-SZ, which is a 2015 plane leased from Kenya Airways in 2016 and put in Oman livery. The seat layout is actually the one shown on Seatguru for Kenya Airways' 787: 2,2,2 3 rows in the front cabin and two rows in the second cabin. 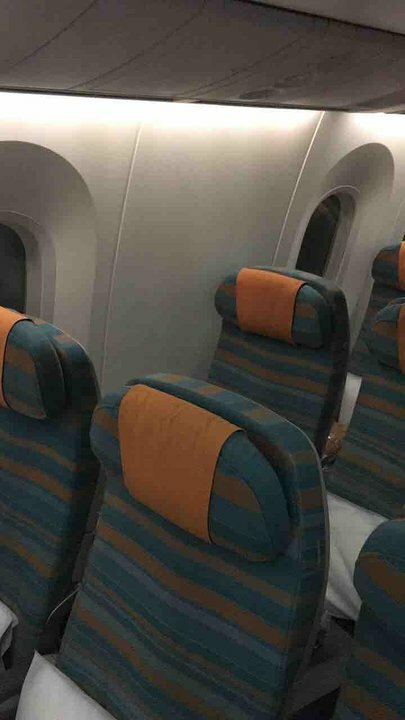 I swear the seats must have been bought used from some other airline because no way these seats were made in 2015. They are uncomfortable, thin and hard. Other 787s in WY service are new inside but A40-SZ is a real disappointment. Good luck sleeping because the chair doesn't muffle the footsteps and vibrations in the cabin. Power outlets are a pain to reach. The window seat requires stepping over the aisle seat to get out. IFE in the front rows is on a pop-up screen and is cranky. Plus Oman has lousy business cabin service (rarely pass through and even forgot to get me the second meal service on an 8 hour flight). Never again. I flew CDG-MCT on WY132 on 787 A40-SB the new cabin. Great seats: compartments with lie-flat bed, good IFE on handset and big screen and excellent international selection (Note: all video and audio are censored, for vulgarity but also sometimes for politics!). USB and power in convenient place, lots of pockets for personal items. Too bad everying else about Oman's business class is so substandard: poor lounge, mixed-class boarding, sloppy service, errors in kitchen. Oman Air has two different B787 seats configuration. The configuration shown here is for B787-800 also named B788 by Oman Air. But I flew flight WY132 with another configuration in business class with old seats and old cabin. Oman air names this aircraft B787 leased. No direct aisle access for window seats. Not at all the same level of confort than the one experienced with B788. The entertainment system and screen didn't work at many seats. Flew the dreamliner 787 busibess class on oman air on sept 1st from cgk to mct. 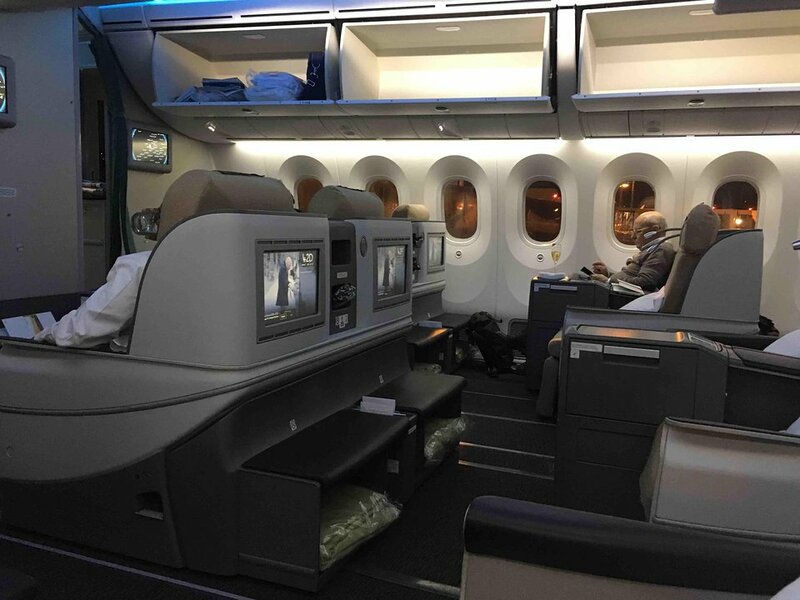 Obviously they have 2 different cabin layouts in 787. our config was 30 in C- I dont know how many in economy. The seat was very nice but not the way indicated for the 18 config. Flat bed- comfy pillows and thick blankets. Excellent food. Overall perfect experience. MCT-BKK and return in April If you're used to Oman Air's A330s and their spacious seating, be prepared for a shock. This is a battery hen experience. Officially 3 inches less leg room made even worse by a couple of inches of magazines in each seat pocket. Good airline, horrible plane. 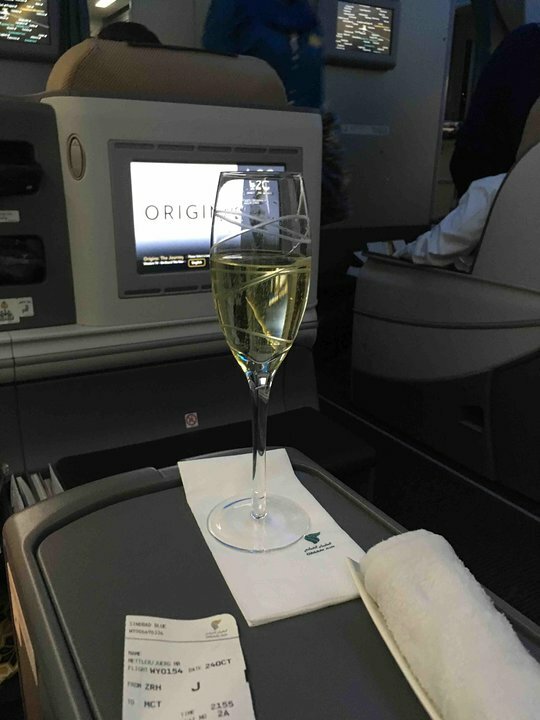 Oman Air flies 2 versions of Boeing 788.